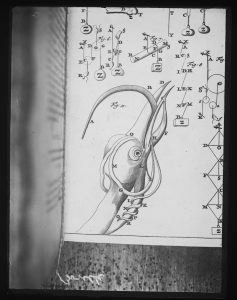 A lantern slide of a scientific diagram of the tongue of a woodpecker, taken from the works of Giovanni Alfonso Borelli. (MS 5315/2/30). You can also see the string (left of the illustration) used by Cole. 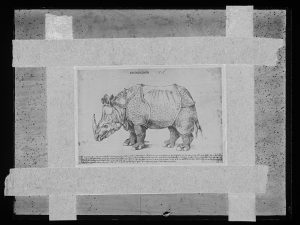 In today’s blog post, Tim and Ceri discuss their progress in digitising the glass lantern negatives created by Professor F J Cole (1872-1959), F.R.S., Professor of Zoology in the University of Reading from 1907 to 1939. Though I am admittedly fairly new to work in archives, I already have the belief that accessibility to collections is the most important part of an archivist’s job. As such, when given the chance to participate in the Cole project – cataloguing and digitising the lantern slides of Professor Cole – I was eager to get started! The cataloguing part of the project has been a learning experience in more ways than one. Not only have I become involved with the nuances of cataloguing hierarchy, as well as using the cataloguing software, Adlib, I have also learnt a great deal about Professor Cole’s collection simply by observing the slides as I catalogue them. For example, I came across an image of Dürer’s Rhinoceros at one point, which encouraged me to research the fascinating story behind it. Once I had catalogued my first set of slides, I moved on to digitisation; essentially, taking high-quality photographs of the lantern slides, editing the images, and adding them to our database of digital assets. I was a little sceptical when I first heard the camera described as a ‘praying mantis’ but it really does fit that description, and it is also enormous! The quality of images it produces is worth it, however, and I’ve relished the chance to get to grips with such high-end hardware. I’m hoping that my contribution to the project will make the Cole collection more accessible to researchers, and I’m looking forward to continuing. 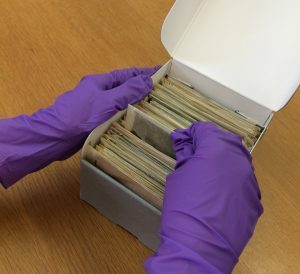 Careful handling of the Cole glass plate negatives. For someone who has an interest in the history of science the opportunity to work on the Cole digitisation of glass plate negatives was a welcome one. However, it was not without its technical trickiness. Cole photographed images from many core medical and natural philosophy texts, from Aristotle to Leeuwenhoek and beyond. He used these images in his lectures and teaching at the University of Reading but also in his published works, something which is evidenced elsewhere in his papers. From these glass plates we can see his process and the painstaking effort he went to reproduce these images, sometimes taking multiple copies of the same image until he was happy with the result. The photographing set up he had devised can be seen in the images with string and pins delicately holding pages in place to enable him to get the best picture possible. When digitising glass plate negatives there is often a choice to be made between digitising the object as an object and capturing the image on the glass. This is particularly true of Cole’s process as he often used tape or paint to conceal or highlight parts of the images he was photographing; a kind of early Photoshop. The materiality of the negatives is fascinating in itself and I hope the efforts to digitise them captures a bit of both the image itself and the condition of the negative as a ‘thing’. It has been quite a task to digitise the photographic records within the Cole collection held at Special Collections. There are almost 1500 glass negatives alone! Stay tuned for further updates regarding the slides as this work continues. The images of the glass plate negatives from the digitisation project for each individual author will soon be available to view on our Enterprise catalogue and through our online database. To learn more about the papers of F J Cole see our previous blog post by Cataloguing Archivist Sharon Maxwell here. For the Cole Museum email colemuseum@reading.ac.uk. You can also follow the Cole on Twitter @ColeZoology.